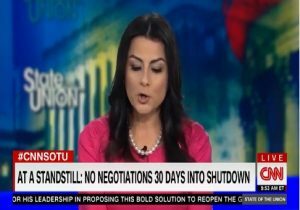 Rep. Nanette Barragan (D., Calif.) spoke out against President Donald Trump's proposed border wall on the grounds that it will force immigrants to "break the law" to get into the United States, during a panel appearance on CNN's State of the Union. "You have the wall built on U.S. territory," Barragan said. "People can get up to the wall and they can still go to a port of entry and ask for asylum and you're still on U.S. territory. What this wall essentially is going to do is help the president with his anti-asylum ban." "They're turning people away, even if they're on U.S. soil," she said. "What is it doing? It's incentivizing them to break the law and come in within the ports." Barragan made these comments just a day after Democrats unilaterally rejected Trump's offer to provide protection for refugee immigrants in exchange for a border wall. Trump offered to extend the Deferred Action for Childhood Arrivals program (DACA), an Obama-era initiative that allowed children of Illegal immigrants to remain in the United States. Trump also said he would open up Temporary Protective Status, which allows refugees from foreign nations to seek asylum. In his plan, Trump would extend both programs by three years. "It is a compassionate response to the ongoing tragedy at our southern border," Trump stated about his deal, adding that he hoped Democrat lawmakers would provide "their enthusiastic support." Speaker of the House Nancy Pelosi (D., Calif.) rejected Trump's plan and in a statement said it was a "compilation of several previously rejected initiatives, each of which is unacceptable and in total, do not represent a good faith effort to restore certainty to people’s lives."